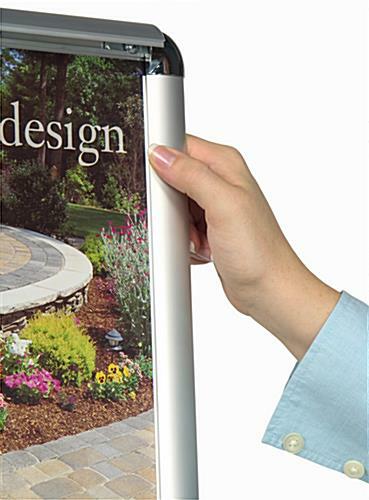 Our product line includes this flyer holder coupled with a poster frame. 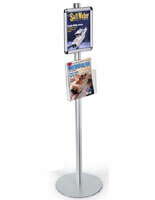 This flyer holder is a free standing literature display and poster stand all in one. It has an acrylic flyer holder, also known as a literature pocket, so that you can display leaflets for customers. 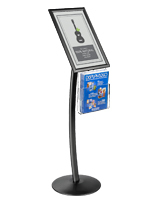 This flyer holder is a literature holder that can be used in banks or retail locations. 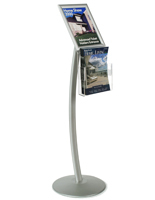 Our flyer holder is literature display that has a satin aluminum finish. Customizing the flyer holder is very simple. 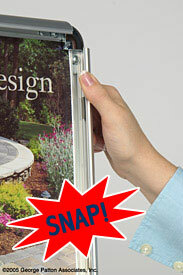 Snap open each of the four sides of the frame and place an 11" x 17" poster inside. The frame has rounded corners which are both for aesthetics and safety. Square corners could potentially cause scratches on walls or people. The rounded corners have a chrome look to them. The acrylic flyer holder arrives in a separate box from the poster stand. 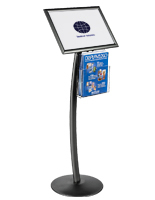 Simply attach a flyer pocket to the stand and you are ready to display promotional literature. This literature rack is a perfect solution for your lobby.